The Trident Series is finished in semi-gloss black which offers a sleek, smooth look. This series also features a skirt, solid top deck and large cabinet doors for easy access and installation of filtration and other mechanical systems. 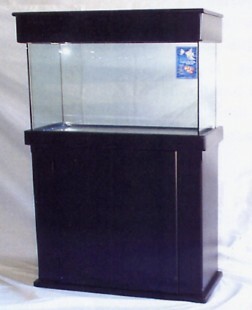 *30 inch overall stand height for optimum aquarium viewing and stability. *Large doors for easy access. *Attached skirt conceals the aquariums bottom frame. *Mathing 6.5 inch canopy available (as pictured).